The Nissan BladeGlider is what the company says will be the future direction of electric vehicle technology, which begs the question: is the future of the EV really a DeltaWing with three seats? A couple of years ago, Nissan dazzled the racing world with its DeltaWing Formula car concept. The car did well for itself on the circuit and is now approved for racing as a regular (non-prototype) vehicle. Next year, the next-generation of the concept will be racing as the ZEOD RC, a hybrid-electric DeltaWing coupe capable of running a full circuit lap on electricity alone - at speed. Clearly, Nissan sees the electric vehicle (EV) as a primary motivator in the future of automotive. This became very clear on opening day of the Tokyo Motor Show when Nissan unveiled the surprise concept it's calling the Nissan BladeGlider. It's a production concept EV based on the DeltaWing design, but adding seats behind the driver and going with an all-electric powertrain rather than a hybrid as in the ZEOD RC. The concept is as breathtaking as it is puzzling. It's a beautiful look that promises superb handling characteristics and head-turning, fun-filled driving. It also begs us to ask the question: Is the future of the EV really a three-seat, DeltaWing-style car? Interestingly, some of the most compelling (and memorable) electric vehicles of recent times have been three-wheelers, usually in a "tadpole" configuration (two wheels at front, one at rear). Notably the Aptera 2e, a car which missed production thanks largely to managerial stupidity rather than proof of concept capability. The Nissan BladeGlider is not technically a three-wheeled car, of course. The front wheels are very close together, similar to the way Farmall used to make tractors, which lends stability while allowing for the superior aerodynamics of the inverted V shape (unlike the Farmall idea, which was to let the wheel ride in a furrow to relieve the driver of steering). From above, as you can see in the photo, the BladeGlider has a shape that immediately reminds us of modern jet fighters like the F-117, an aircraft style known as a "flying wing." Targeting the visionary individual seeking visceral driving and sustainability, BladeGlider goes beyond sheer power and acceleration to send the heart soaring into new realms of smooth "gliding" pleasure. Nissan also admits that the triangular shape of "swept wing" aircraft and the soaring, silent freedom of a glider are the inspirations behind the BladeGlider itself - and help explain the name. The concept is meant to be disruptive of the status quo and it can definitely be seen as that. The front track is only one meter wide, not only are the aerodynamics of the BladeGlider very high, but cornering at high Gs is also more achievable. The front:rear weight distribution of the car is 30:70, keeping the vehicle from tilting in a hard turn and putting the downforce of the car on its rear drive wheels. Aerodynamics help this downforce. In a near-3-wheeled setup, uneven weight distribution is the key to balance and in this case, Nissan seems to have a sweet spot for the BladeGlider. Two motors propel the BladeGlider forward, each independent of the other to allow for speed differentiation giving better control. The batteries are slung low and to the rear to achieve the weight distribution mentioned. They are the same lithium-ion batteries used in the LEAF, of course, but the motors are mounted in the wheels rather than on an axle. This is Nissan's first try at that, but it has obvious advantages along with some disadvantages which the company overcame with wider tires and a stiffer suspension rig. Nissan's aim with the BladeGlider is to achieve a "soaring" experience akin to that felt in a glider, but accessible to everyday drivers. The cockpit layout and canopy mean a wide-angle view of the world from the car as well, enhancing the "gliding" experience. 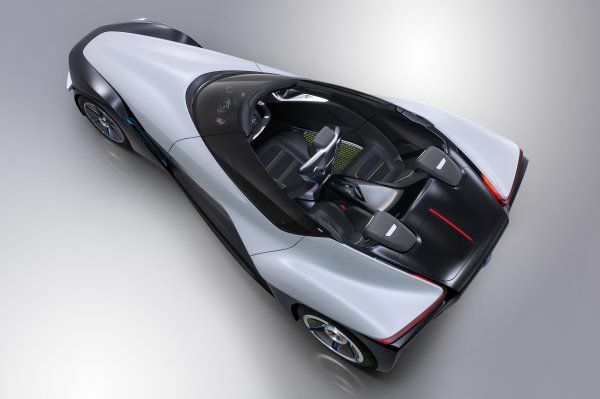 Overall, the Nissan BladeGlider is an aerodynamic rear-drive performance car that happens to be electric with all the silence and smooth feel that entails. Is it the future of EVs? Probably not. The future of one style of EV? Very likely. No plans for production have been announced, but Nissan has made it clear that this is not just an auto show concept to wow audiences, but a true production concept that they plan to pursue in some fashion. Can't wait. Can you back up this statement? I can't find a single instance of any equipment used that would support this concept. "unlike the Farmall idea, which was to let the wheel ride in a furrow to relieve the driver of steering"
Early Farmall advertisements showed the close-in front wheels with their characteristic V-shape and proclaimed that they were easier to steer and could "drop in the furrow" when working the field. I have a copy of a 1928 ad from a magazine which says exactly that.